Sto products have been used to clad sections of the new 1,677 bed Queen Elizabeth University Hospital campus in Glasgow’s Govan district. The StoTherm Vario M system was applied to a supporting rail framework, creating a drainage cavity which provides the wall structure with a secondary line of defence from the effects of the weather. The system was finished with StoLotusan - the only render that incorporates Sto’s patented Lotus-Effect® which creates a unique microstructure surface. This structure allows StoLotusan to deliver outstanding water and dirt repellence and provide effective protection against the growth of algae, keeping the façade cleaner for longer. The hospital courtyards feature the same StoTherm Vario M insulation system, but with a StoSilco Top Coat. “This silicone resin render offers very high levels of water repellence combined with a tough finish and so it’s ideal for those areas of the hospital that may be exposed to harsh weather and damp,” adds Alan. It is also resistant to aggressive atmospheres and to the growth of algae and fungus. 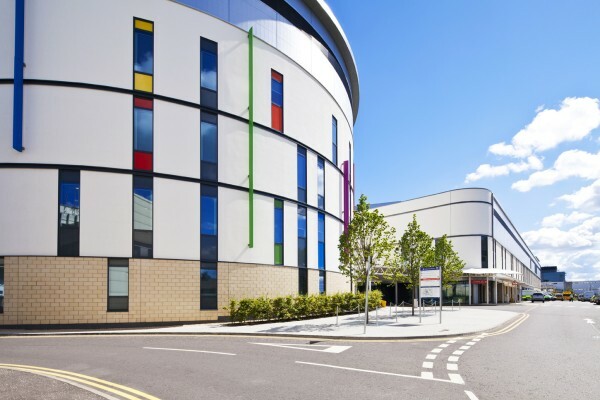 This was coated with Sto Lotusan render to provide a rugged and reliable surface that will allow the hospital building to retain its attractive appearance well into the future.